SportsTracker is an application for people who want to track their sporting activities. It is not bound to a specific kind of sport, the user can create categories for all sport types such as cycling, running, swimming or tennis. The main advantage is a good overview of your exercises, you can easily create diagrams and statistics for specific date ranges and sport types. In the calendar you can also track your body weight or create note entries, e.g. the training plan or upcoming sport events. All the application data is stored in XML files. So it is very easy to access them with other tools or to write importers and exporters for other applications. 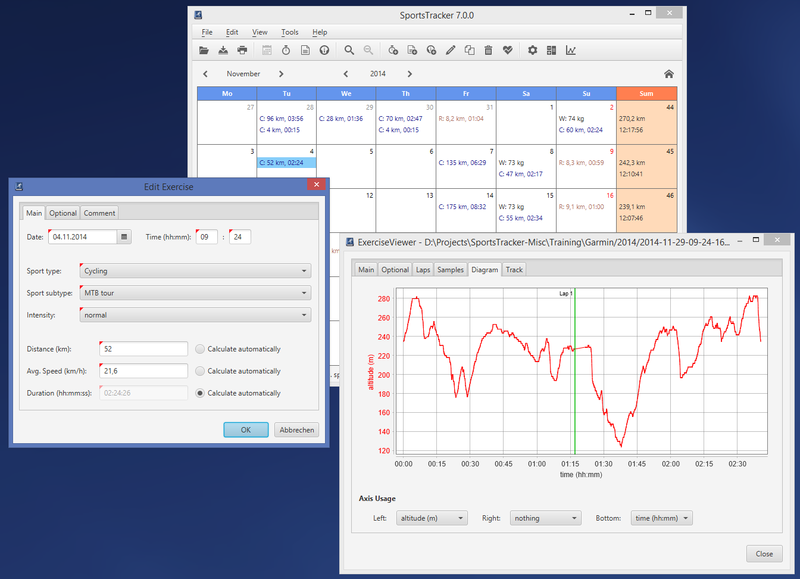 If you are using a heartrate monitor with a computer interface you can display the recorded exercise files and evaluate the diagrams with the integrated ExerciseViewer application. You can organize them by attaching the recorded files to the exercise entries. When adding new exercises you can import the data from the recorded exercise files. Users of heartrate monitors with an integrated GPS receiver (e.g. the Garmin Edge series) can also view and replay the track of the recorded exercises in the interactive map viewer component. 2019/02/07: Version 7.6.0 has been finally released, which contains some long requested features. The user can now define for each sport type separately whether speed data is handled as speed or pace (e.g. for running). Alex Jarosch has provided support for descent exercise data (similar to ascent) and improved support for cadence and steps handling in Garmin FIT exercise files. The Java runtime has been updated to version 11.0.2 (uses AdoptOpenJDK now) and Kotlin to version 1.3. Because of the removed packaging system in Java 11, the packaging for Windows, macOS and Linux has been completely rewritten. And the reported macOS 10.14 problems have been fixed in the updated JavaFX library. The list of all changes and bugfixes can be found in the changelog. 2018/11/03: Warning for all macOS users: after updating macOS to 10.14 (Mojave) you will get crashes of the SportsTracker application. This is caused by a known bug in JDK / JavaFX, which has not been fixed yet. There's a manual workaround to avoid the crashes: Open "System Preferences" and select "Security > Privacy > Accessibility". There you need to add the installed SportsTracker application to the list. 2018/03/30: Version 7.5.0 has been released. There are many improvements and bugfixes in the Exercise Viewer, e.g. 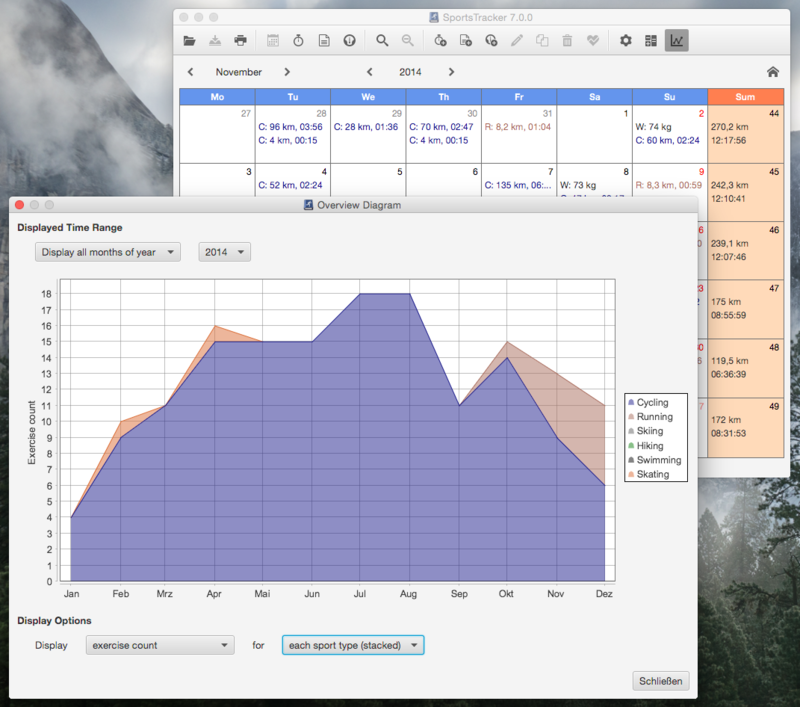 the Diagram Panel is now easier to read due to transparent area charts instead of line charts. And it also displays an average line now. The support for exercise files from Garmin monitors has been improved too, if you had problems you need to test this version again. This update also contains many internal changes, Java has been updated to 9/10 and all unit tests are now using JUnit 5. The creation of native installation packages has been rewritten, Windows users need to use the 64bit version now (Java 10 is for 64bit only). 2017/10/01: Version 7.4.1 is out, which provides minor feature updates and exercise file parser improvements. Users of recent or updated Garmin devices need this update, otherwise new recorded exercises might not be displayed anymore. The Exercise Viewer component has been rewritten completely in Kotlin (except for some Java parsers), Groovy is not used anymore. This provides less code, better fault tolerance and an improved maintainability. The Diagram Panel has been improved as well, the graphs are better readable now. As always, the list of all changes and bugfixes can be found in the changelog. The Diagram Panel supports chart smoothing now, this makes charts with much data better readable (mostly for speed, cadence and heartrate). The smoothing is optional and can be disabled in the preferences. 2016/10/08: Version 7.3.0 has been released. This release provides a new generic entry filter for exercises, notes and weights, so it's easy to find any entries you're looking for. The user can now export all his data to a SQLite database, this enables new possibilities for evaluation or migration (see the README for details). As usual this version also provides several bugfixes, here's the full changelog. 2016/04/24: Finally the issue tracking for bugs and feature requests has been migrated from SourceForge to GitHub. All open and closed issues have been moved to GitHub, they can be detected by the issue label sourceforge-migrated. Unfortunately user assignments and attachments can't be migrated automatically, that's why all migrated issues are assigned to user ssaring. The original names can still be found in the issue text and comments. The SourceForge issue tracker will stay online read-only, so attachments can be looked up there. Starting today, please use the new GitHub issue tracker only, also for existing issues. 2016/03/25: Version 7.2.0 has been released, this release contains many small improvements and bugfixes. The Exercise Viewer now displays the device names and support has been added for Polar RCX3 devices. The updated Garmin FIT library also provides support for many new devices. Internally the DI framework has been replaced (less dependencies and faster startup) and the native packaging has been improved. 2015/06/20: Version 7.1.0 has been released, this update provides some minor improvements and bugfixes. All the dialogs are now using the new JavaFX spinner and formatted text field controls for easier input. Full support for HiDPI / Retina displays has been added (tested on Mac OS X) and the translations has been updated. The native installers now contain Java 8u45 which provides a lot of JavaFX bugfixes. As always, here's the full changelog. 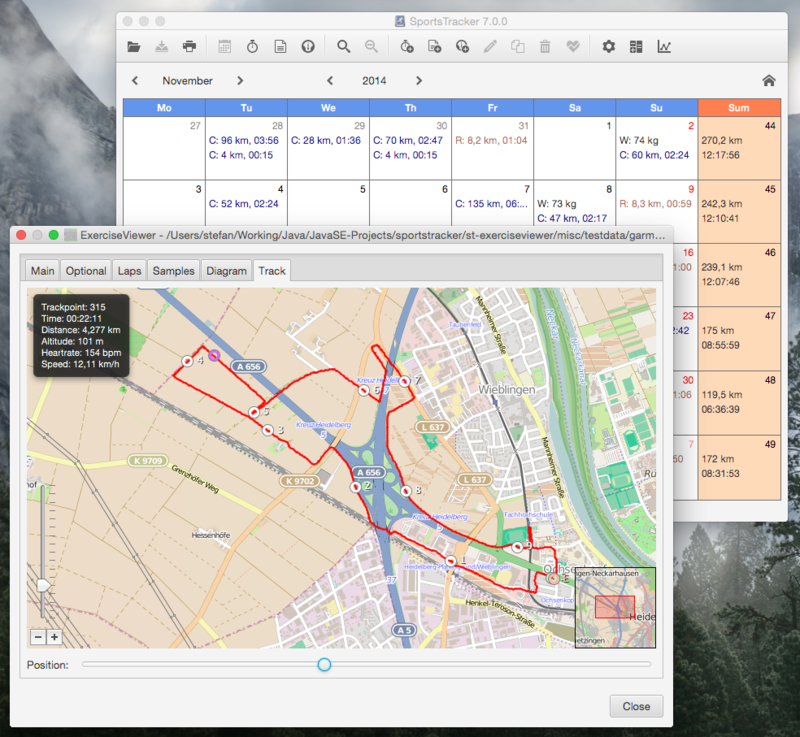 2015/02/27: SportsTracker 7.0.0 has finally been released. Here's a list of the major updates, you can find all changes in the changelog. 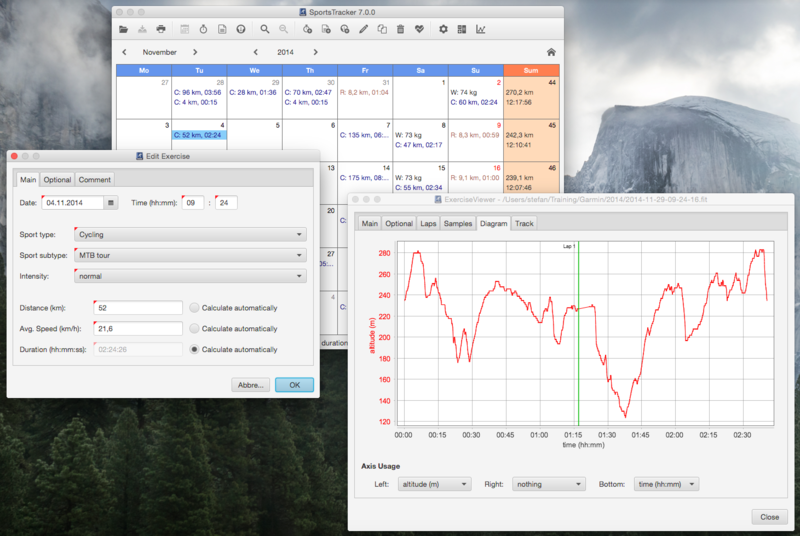 Full rewrite of all SportsTracker and ExerciseViewer user interfaces by using the JavaFX toolkit instead of Swing. Swing has been deprecated, JavaFX is the successor supported by Oracle. 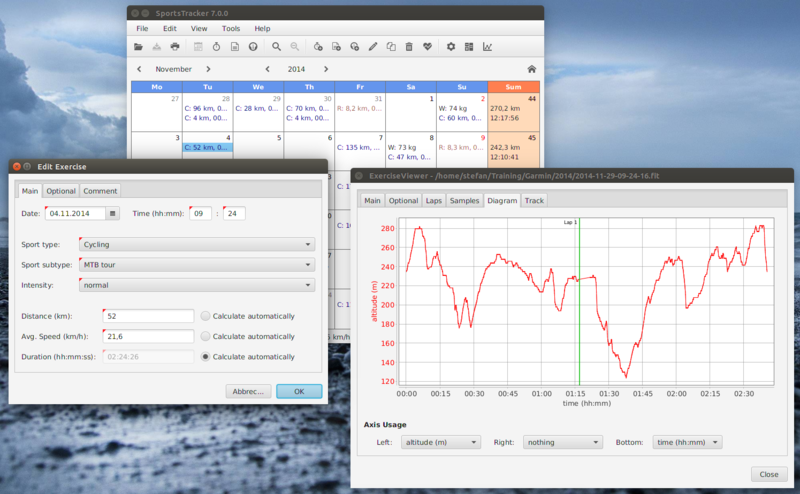 JavaFX provides an improved look & feel (same on all platforms), which now also works perfectly on Linux. 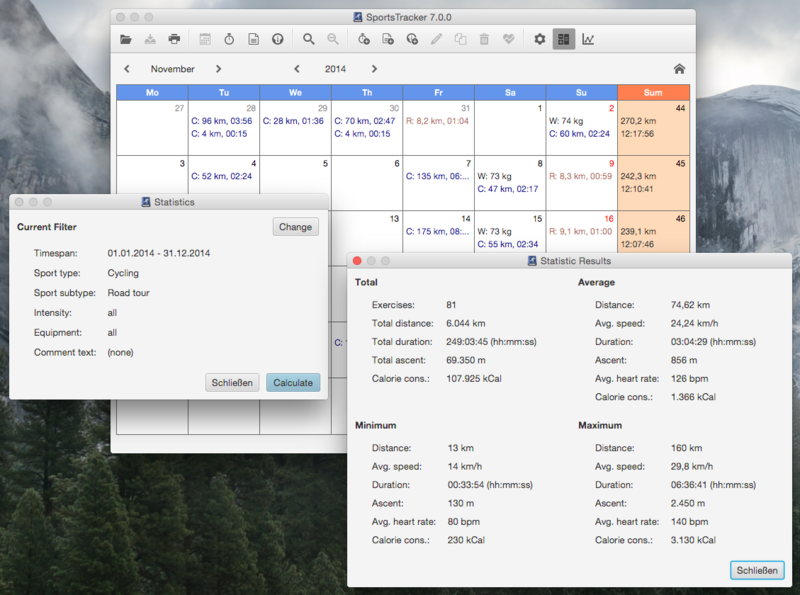 Native SportsTracker packages and installers for Windows, Mac OS X and Linux. The packages include the Java Runtime Environment (JRE), this makes installation much easier. A Java installation is not needed anymore, SportsTracker always uses the proper Java runtime now. Added instant input validation in all SportsTracker dialogs. New icon set, based on the IcoMoon project. The Track Panel in the ExerciseViewer now provides a slider for replaying the exercise track on the map. Use of Java 8 language features in ExerciseViewer. Added korean translation (by Tae Young Ko) and updated french (by Nicolas Ollivier) and spanish (by Luis Llorente Campo) translations. SportsTracker is an application for the Java platform written in Java and Kotlin. It was developed and tested with the OpenJDK JVM, other JVM implementations will probably work too. The SportsTracker installer packages contain an embedded Java SE Runtime Environment (JRE), a Java installation is not needed. Users of binary packages need to install the JRE before, the OpenJDK can be downloaded e.g. from the AdoptOpenJDK project website. If you want to download exercise files from your heartrate monitor you might need one of the tools listed above. The application was tested on GNU/Linux (e.g. Ubuntu 18.04), Windows (e.g. 10), Mac OS X (10.13, 10.14), although it should work on all systems with the required Java Runtime Environment. For Windows, Mac and some Linux systems there are native installer packages available on the SourceForge project page. They include an embedded JRE, so you don't need to install Java before. The installers will create a menu entry for easy SportsTracker startup. If you are not using an installer, you need to download the ZIP archive with the application binaries or sources. Please see the included README.txt file for detailed installation instructions. Please use the issue tracker on the GitHub project page when you have comments, suggestions or problems with bugs. If you want to contribute improvements or translations, feel free to fork the GitHub repository and submit Pull Requests. It would be great when bigger changes could be discussed before starting the implementation.